Monthaven's Chardonnay is crafted from selected vineyards throughout California's Central Coast, with a focus on fruit from Santa Barbara and Monterey. The Santa Barbara components deliver rich tropical notes on both the nose and palate, while cool climate Monterey components deliver crisp apple notes and balanced acidity. A blend of cold fermented, barrel fermented and barrel aged wines, this Chardonnay is full of flavor, with balanced acidity and a clean finish. 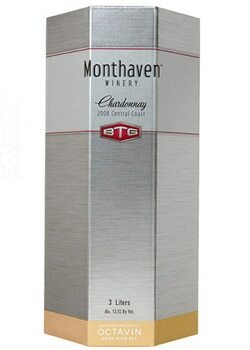 The three-liter Octavin box packaging provides exceptional value.